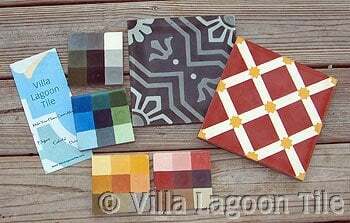 Designers normally take the finished cement tiles from the Tile Planning sample kit together with print-outs we can provde of your desired layouts and the color-sample tiles to discuss a project with their client. We offer a "customized" approach and part of the traditional manual production of these tiles that we normally do not see the custom tiles beforehand, just as with a couture dress-maker. You see the materials, the plans and you have already seen the quality of our work in the finished cement tiles in your Planning Kit. 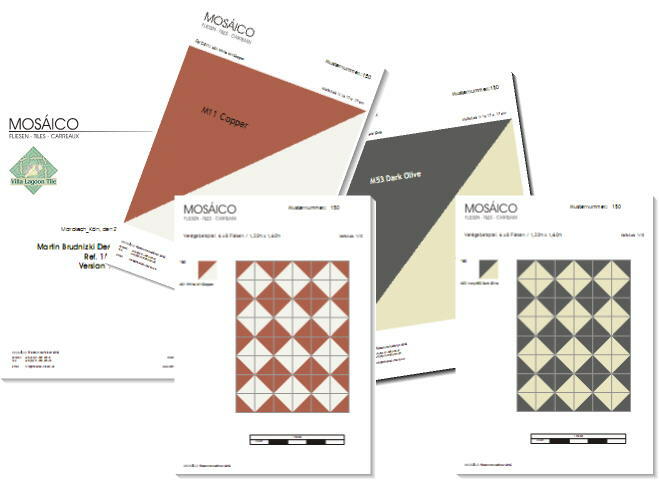 We can supply colorful pdf's to present to your client that show your tile selection in your choice of colors. Just ask us! The tile reference number and what version (colors) you require ? How many tiles of the selected tile do you require ? We will do up to 16 tiles and up to two designs or color versions. We must have your International customer account number for Fedex or DHL to forward the tiles. We must have an email from you asking us to send samples on your shipping account and the cost (required by local FedEx/DHL Offices there). Time frame of potential project, when to open, when tile installation begins ? Net-surface in Square meters or Square feet to be covered ? Tiles have to be made and cured at least partially to be shipped. Expect approximately 10-12 days for mixing colors, pressing the tiles, curing, packaging, starting from receiving the definite briefing for samples. Please let us know if you wish to move forward with the custom samples, and we can provide payment details. To best help our customers avoid the difficulties of producing custom sample tiles, we try to keep a sampling of various styles and the planning kit to facilitate order decisions.